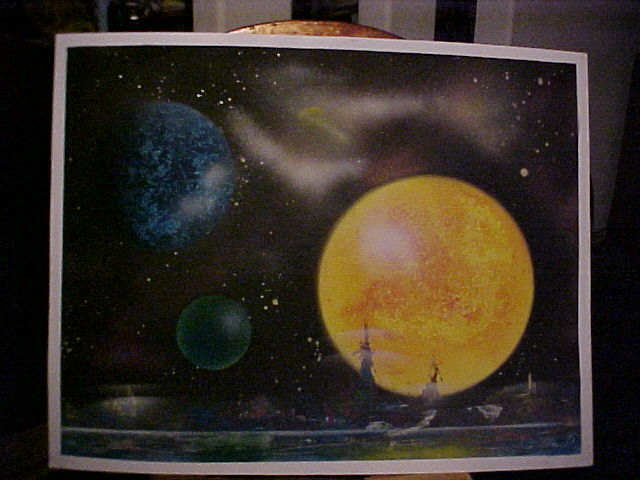 This is a technique that I learned from either Ricardo Ponce or Hugo Montero in New Orleans in 1989 or 1990 just down the street from the Cafe du Monde - Several works were given away in San Antonio; one was sold on canvas and another was auctioned as a fund raiser. This is a most unique art technique and a crowd pleaser. Dr. Ervin Mendlovitz (of San Antonio) and I both learned the technique and we traveled to Del Rio and Piedra Negras several weeks after our return to perfect the style which we did to our own satisfaction. It is just one of those many styles I have learned thru the years that I put 'on hold' while I traveled the North American Continent. The popularity of this technique even to this day speaks to its unique appeal to the human soul. Somehow it connects to a hidden part of our universe. I had to go back and research the original artists. And Hugo Montero is now a fellow Texan; living in San Antonio where I spent many years. 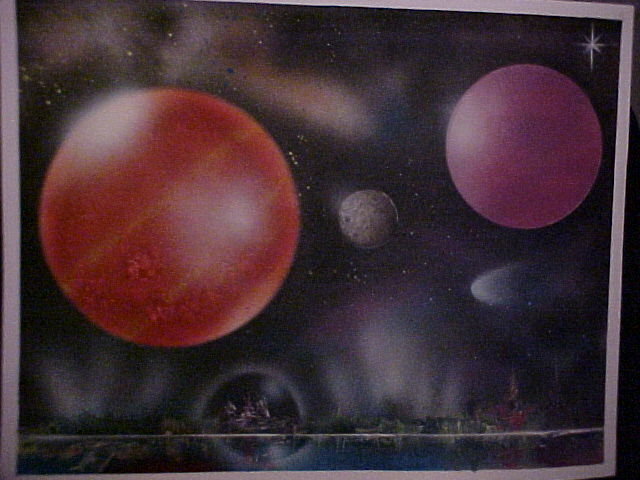 Hugo Montero is the last of the first generation of spray paint artists to still be producing this genre in the United States. Montero, one of the major innovators of the technique developed by its originator Ruben Sadot Fernandez (known as Sadot) in Mexico City’s Zona Rosa in the early 1980s. 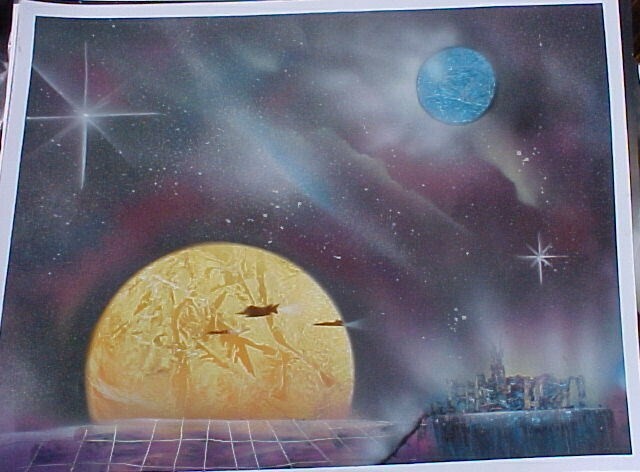 Sadot, who died in 1988, would never have imagined that his freestyle creation would become a worldwide phenomenon with one or more artists producing some form of his invention in almost every major city. 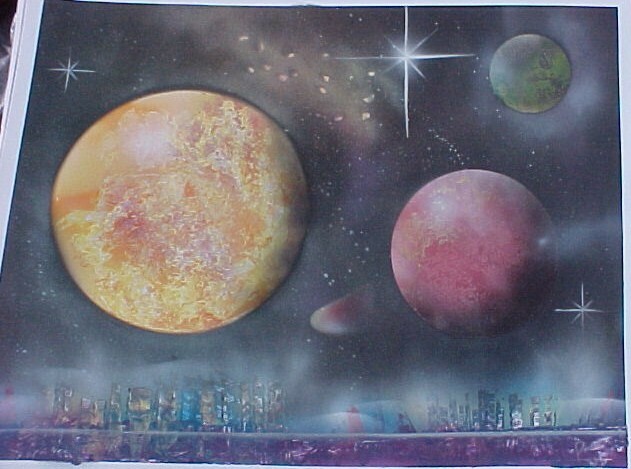 The art form, also called Aerosolgrafia or Sadotgrafia by its founders, is the hybrid child of the avant-garde art movement that flourished in Mexico’s capital after the social and political repression of the ‘60s and ‘70s. 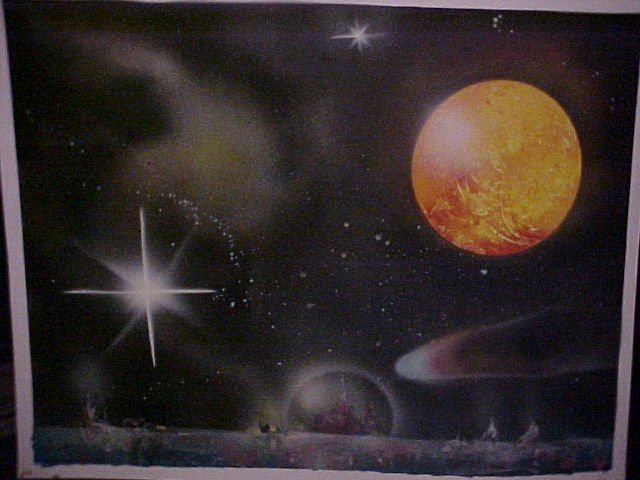 Mexican artists were influenced by American and European urban art forms such as graffiti, pop art, jazz fusion, beatnik poetry and pantomime. 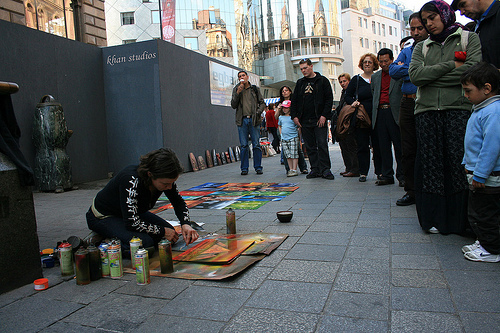 Even though there was no graffiti in Mexico at the time, the concept of creating rapid art on the street took root. Sadot was a poet, intellectual and performer. 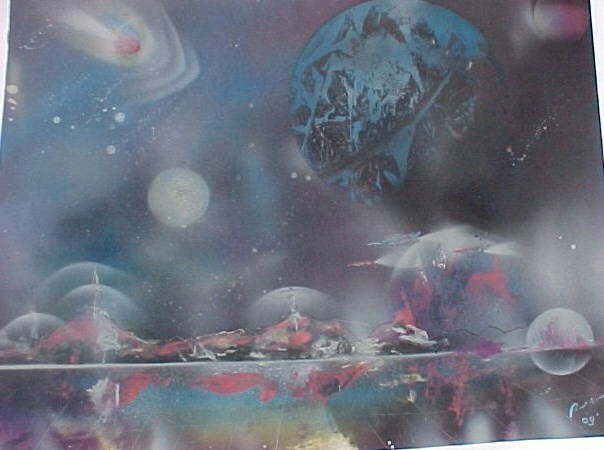 His foray into spray paint began as an experiment that he brought to the street. He sat in a lotus position surrounded by aerosol cans, and effortlessly created exquisite human faces, figures and landscapes on paper, cardboard and canvas without the use of a brush. He worked to music, ranging from classical to rock to pre-Hispanic Aztec beats. While he painted, he often shared his strong opinions and metaphysical observations on culture and politics with the crowd. Sadot died walking across a busy freeway early one Saturday morning. Jimenez (El Moreno), one of the creators of the art, always resistant to publicity, agreed to appear on TV this one time to give homage to Sadot. Many other events occurred within the next months, such as a reception and exhibit at a fancy hotel downtown—the first major show in a commercial gallery, and a tribute exhibit underwritten by the country’s ruling political party, the Partido Revolucionario Institucional (PRI), which is ironic since Sadot and most of the spray can artists were anti-PRI. The famous Mexico City artist Felipe Ehrenberg, who had been using spray paint in his non-traditional art forms for years, asked to join AMPA, dramatically raising the profile of the organization. However, despite positive media attention and growing support for the art, the economy was still in bad shape. 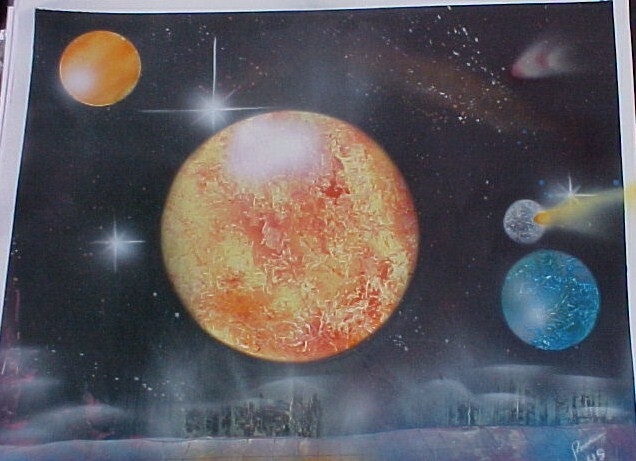 Luis (El Mexican) was the first to paint in the U.S. after Montero and he stayed in Los Angeles for a number of years, teaching others who then fanned across the U.S., among them a talented young Mexican named Ricardo Ponce, considered by some experts to be the most technically gifted spray artist in the world. Ponce lives and works in New Orleans. Montero ended up staying in the United States after going see The Who in Houston. 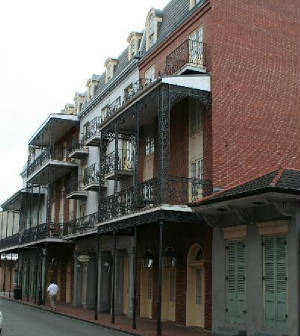 In 1989 he settled in New Orleans where he was offered a job teaching Spanish in the public schools. He lived there for many years and his reputation as an artist grew. At the peak of Montero’s popularity he was voted one of the "40 Under 40 People to Watch," had shows at the New Orleans Contemporary Arts Center and the Smithsonian in Washington DC, collaborated with MTV, and was invited to be a celebrity judge at the Hawaiian Tropic beauty contest in Honolulu. He painted fine art for gallery shows while continuing to paint on the street where he teamed up with Ponce for about five years. A journalist writing an article about Montero in New Orleans dubbed him CanGogh and the nickname stuck. Many of these were produced nearly 20 years ago. 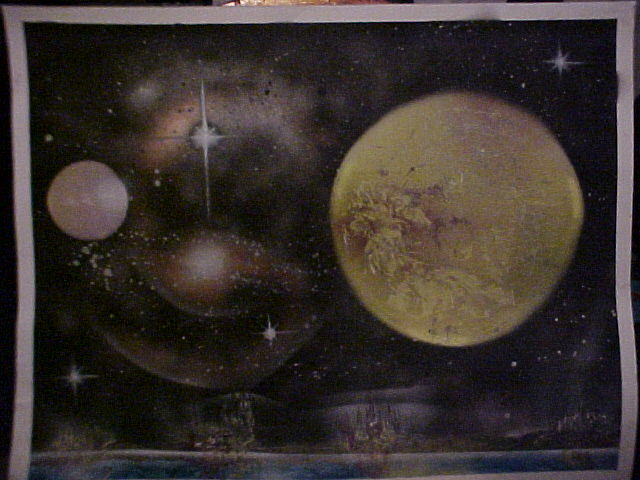 First example for 2009.